Each bathroom Has a 70s style with very colorful ceramics. Additions to barbecue in the villa is equipped with a wood-burning oven to cook the pizza and any kind of roasted meat. In the Villa you can find a plan, if you want to entertain you During your stay. We will show you where to buy the best milk and bread in the area, the baker who is very close to the Villa. This is an ideal property for a family gathering. It is difficult to find any faults with this place or the service provided. First off, everything worked and there was enough capacity. So, two washing machines two dishwashers and lots and lots of high quality kitchen kit including one of the best coffee makers I have ever used. Secondly the house has enough space for communal activities without feeling crowded and also the bedroom suites are large enough for couples to be on their own in substantial comfort. Thirdly the garden is extremely well kept( with a gardener/helper coming every day which is a plus for queries) and provides a lot of shade for children to play and adults to relax in.In common with everywhere we went in Italy at this time there is a problem with mosquitoes, so take precautions. Thoroughly recommended for family reunions.! Villa Tre Querce, Paradise Found! My brother, Gary, and I rented Villa Tre Querce for five weeks starting June 2nd of this year. Obviously, a trip of this magnitude has taken a long time to plan and to execute. It has been a little over a year in the making and turned out even more magnificent than we dreamed possible. If you have rented from VRBO previously you probably have run into the situation where reality of a place isn't the same as the pictures on the website. Villa Tre Querce turned out to be exactly the opposite. The pictures don't do it justice, it is more magnificent than the pictures can portray. The swimming pool was great and got a workout from all of the kids we had visit. Manlio was there to meet us when we arrived on the 2nd. He gave us the grand tour and answered all of our questions. He introduced us to the young fellow that is the property care-taker and said if we needed anything he could help us as well. Over the five weeks we had 32 visitors come and go. Manlio came over four times to make pizza for each of the different groups that came in. That, my friends, is worth the price of admission. Manlio is truly a good entertainer as well as a great pizza chef. The largest groups we entertained were 14, which we did twice. The house held everyone with ease. As you can imagine having crowds like that would seem to be daunting, but it wasn't. The house has as good a kitchen as you could ask for, with two ovens and two dishwashers, all the utensils a professional chef could ask for. The only thing that would improve the kitchen would be a spoon rest! During our stay we ate zero meals in the house. Manlio had set up the patio to serve 14 and that was where we spent our home time. For those of you inclined to cook, this is the place to do it whether inside or out. The outside grill is wood fired and we hadn't done that in years, but it turned out to be a hit as well. We did Bistecca Fiorentina, the national dish of Tuscany, twice and doing it on wood was fabulous. 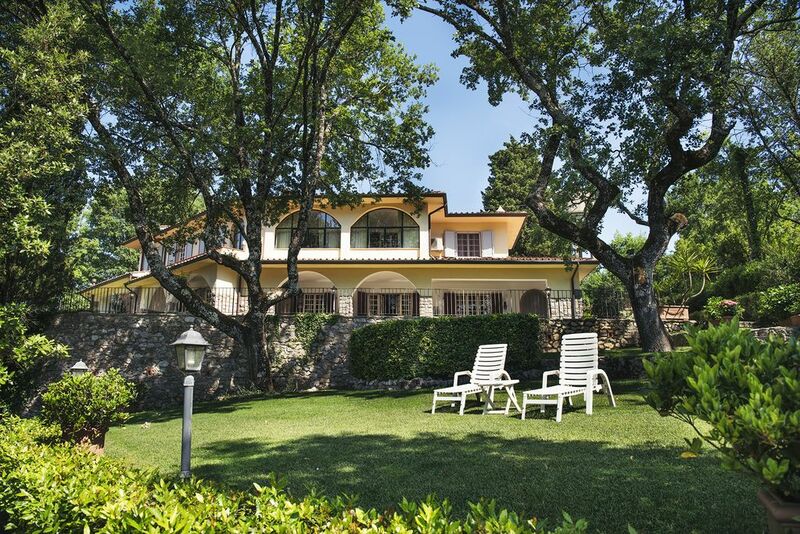 For any family looking for a place to use as a base to enjoy Tuscany, you need look no farther. This is the place you need to come to. It has all of the amenities of a true Villa, from the striking 4 or 5 acres of grounds to the elegant interior and the beautiful pool. We couldn't think of a better place. Manlio and Chiara, whom we entertained at dinner our last night, did everything in their power to make our visit a dream come true. They were the definition of the gracious host and hostess. This villa exceeds expectations. Seven adults stayed the last week of May, and we enjoyed the beautifully manicured grounds, splendid gardens, and lovely home. There were enough bedrooms and bathrooms for all. Mario (owner) was helpful and accommodating. The view from the back veranda was sensational; we had all of our. meals out there, as well as some naps. We took several day trips to other Tuscan towns,and the location of the property was good for that. Highly recommend. I'm not sure where to begin except to thank Manilo and Chiara (owners) for allowing us to stay in their wonderful home. The property was perfect for our family members (11 total). The 5 bedrooms plus the downstairs area provided lots of space and privacy. The house itself was amazing and the large, well-manicured property gave you privacy from neighbors. There is also a large, long patio and tables to accommodate eating outdoors. Many of the rooms also have balconies. The house has a gated entrance and sits up on a hill overlooking a beautiful valley. There is also a pool, but the pool is unheated and it was still a bit cold so we didn’t use it much. In the summer months it will surely be a nice feature. The groundskeeper (and house assistant) Ramel lives on the property and was pleasant and helpful. He not only keeps up the grounds but cleaned the kitchen and bathrooms twice during our stay and helped serve food on a couple occasions. Manilo met us upon arrival and showed us around the property. We arranged for 3 meals during our stay (for an additional expense). Manilo cooked us a meal on the first day and even joined us for dinner, a delightful host. He also arranged for meals from a local chef on two additional days. The food was prepared offsite and delivered to the house where Manilo and Ramel served the meals and cleaned up afterward. The property also has an outdoor brick oven and we used it one night to cook our own pizza’s. It was a great evening of family fun. We arranged for drivers to take us on day trips to many towns and wineries in the area. We were able to see lots of Tuscany and loved it. You can expect to pay an additional charge for electricity and gas used during you stay. You will also pay taxes on the rental fee. The electric/gas charge will vary depending on usage and time of year with our charge around 400 Euros in mid-May. The only thing that was a bit of a challenge was the hot water. The house is large and has a hot water recirculation system which means it heats water and runs it through the pipes to minimize delays in getting hot water. We were advised by the owner to turn off the hot water heater and circulation pump when not in use (while sleeping and when gone during the day) to reduce electricity and gas charges. Some of the bathrooms had lower water pressures and were a bit challenged to get hot water (only warm), all manageable. Overall, we’d come back again.! Thanks Manilo and Chiara. Remote control electronic gates open to drive up to the house. A care taker lives above the garage. Ramer keeps the multi acre grounds meticulously maintained. The owner and his daughter are lovely hosts and did their best to make us comfortable. There are three ovens, three dishwashers, two gas cook stoves, wood ovens, two washing machines, wood stoves, pellet stoves and balconies and porches everywhere. Mini-split A/C units in the bedrooms are efficient for cooling or heating an individual bedroom or open the doors and cool the house. The house is ideally situated at the top of a hill just outside the city on the north side. Go north on windy country roads to Chianti, Volterra or many magical hill towns. Go south and you immediately enter Siena. You can spot the stone water tower on the hilltop property from miles away looking across vineyards and olive groves. Typical of Italy, bathrooms have bidets and tubs although 3 have showers. The hot water is circulated so water is quickly warm at any fixture. I loved the upstairs sun porch for reading on a couch which opens with French doors from the master bedroom. There is a breakfast nook there also. There is an option to eat in the kitchen or a more formal dining room or several areas outside. Furniture was comfortable and nice. A favorite hill town near by is Castello di Monteriggioni only five miles away. We had dinner there three of the nights because it was easy to park there and beautiful. Downtown Siena is of course magical but requires special driving skills and inventing parking spots or some walking. We did day trips to Pisa, Florence, Volterra, and the Mediterranean. Some things to know. Energy is expensive in Italy. Since you pay for gas and electric with this rental be aware costs are 4x what they are in the USA. Better to use the wood or pellet heat then central gas heat. The utilities are not a big deal but expect to settle up in Euros before you go. We loved the pellet stove in the living rooms in the mornings. The upstairs foyer TV has English channels. There are two Wi-Fi internet routers to connect to and cell phone service is strong throughout the region and in the house. The Google Translate was a helpful app for knowing what we were buying at the store. What a great vacation. Enjoy a real gem in Siena. with the area of ​​the 'Gallo Nero' (Black Rooster) Which Produces the famous Chianti wine. all places of rich history With Their museums, good restaurants, and anche very famous for the wine where you can do enologic tours. This holiday is for Those Who love art, nature, and anche outdoor sports, in fact with regard to the fishing we recommend 'Rancia Lake' near Sovicille, and 'Vallechiara' which is another place very nice for fishing. Then we can recommend the 18-hole Golf Club 21 km from us. Just below the villa there are many riding stables where you can go horseback riding or riding lessons, one of the closest (1km) is the 'Equestrian Center Senese'. The area is very suitable for mountain bike, no shortage of trails and woods to go. For Those interested, consistent with the different periods of the year, you can hunt es. , Pigeons, wild boar, roe deer, pheasants. If you want you can rent a car or vintage car. We will be happy to inform you about all the activities listed, where and how to go.